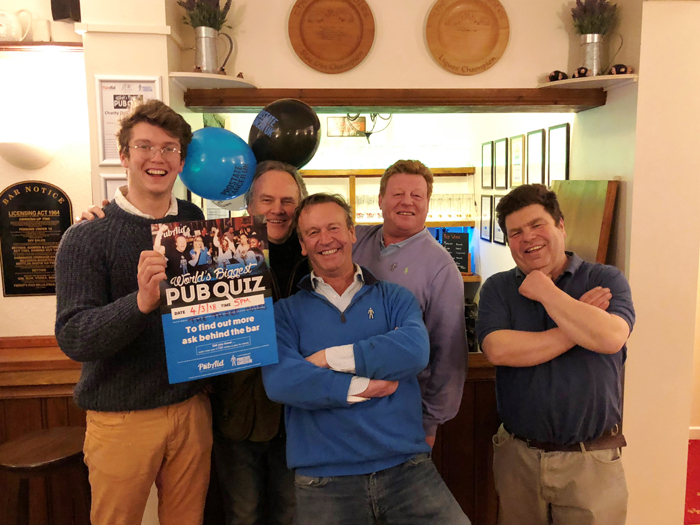 Pubs, bars and clubs are being urged to reserve a date in their diaries between 3-7 March next year for the World’s Biggest Pub Quiz – a fundraising initiative organised by PubAid to raise money for charities, including their official charity partner Prostate Cancer UK. The inaugural World’s Biggest Pub Quiz took place in 2016, and it has since grown in size and popularity. In 2018, 1,500 pubs took part raising £190,000, making up the impressive £405,000 that the three quizzes have raised in total. Landlords and licensees will receive a free quiz pack on registration, including two sets of quiz questions, posters and social media assets to encourage customers to come along and join in. Co-founder of PubAid, Des O’Flanagan, said: “This is a busy time for licensees as they focus on the festive season. However, most pubs won’t be this busy in early March, so it’s a good idea to start planning events that will encourage customers to visit in that quieter time. The World’s Biggest Pub Quiz is scheduled for 3-7 March 2019, but the organisers stress that this window is a guideline, not a requirement. Pubs who want to take part but can’t run the quiz during that week are welcome to run it at any other time in 2019. Each pub is free to choose a charity of choice to support, and those unsure are encouraged to raise money for official charity partners, Prostate Cancer UK. James Beeby, Director of Fundraising at Prostate Cancer UK said: “The World’s Biggest Pub Quiz has grown over the past three years and we are incredibly grateful to all the licensees and customers who have been involved so far. To be PubAid’s charity partner once again in 2019 is fantastic and we want to encourage as many pubs, clubs and bars to sign up and join in the fun! Quiz packs will be sent in early 2019 to all pubs registering at www.worldsbiggestquiz.pubaid.com. Alcohol education charity Drinkaware is supporting Network Rail ahead of the festive season, by delivering training sessions to staff at some of the country’s busiest rail stations, equipping them to recognise and support people who may be vulnerable after drinking alcohol. The training is part of Network Rail’s response to a 17% increase in the number of alcohol related incidents reported on the railway in December 2017¹. They are urging festive party-goers to look after themselves, friends and colleagues when travelling on the railway, and are working with British Transport Police to hold alcohol awareness events at rail stations across the country, encouraging revellers to be a ‘First Class Mate’ and look out for those making their way home by train after one drink too many. The Drinkaware training for Network Rail staff will include key elements of the Drinkaware Crew scheme and the Alcohol Vulnerability Awareness e-learning programme, which were both designed to give customer-facing staff the skills and knowledge to identify alcohol-related vulnerability and support customers at risk from harm. The training will take place at Birmingham New Street, Leeds, London St Pancras, London Bridge, London Victoria and Glasgow stations. Elaine Hindal, Drinkaware Chief Executive said: “Christmas is a time when many people find themselves drinking more than they normally would. 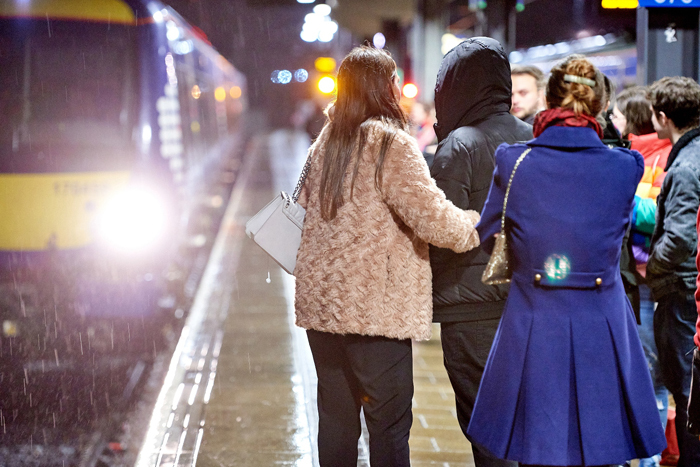 “That’s why it’s vital that we all look after ourselves and each other on a night out and why we are delighted to be working with Network Rail on this important campaign. “Drinkaware’s vulnerability training and Drinkaware Crew scheme are designed to equip employees to provide support to people on nights out and have been successful in helping organisations reduce alcohol related harm across the UK. Drinkaware Crew was initially designed for bars and clubs with a 500+ capacity and has been activated in 21 areas across the country. The training has also been adapted for other environments where people may be vulnerable after drinking too much, including the Splendour Festival in Nottingham in July and the ‘Pace Yourself Plus’ initiative developed with The Racecourse Association and implemented at a number of high-profile racing events this year. 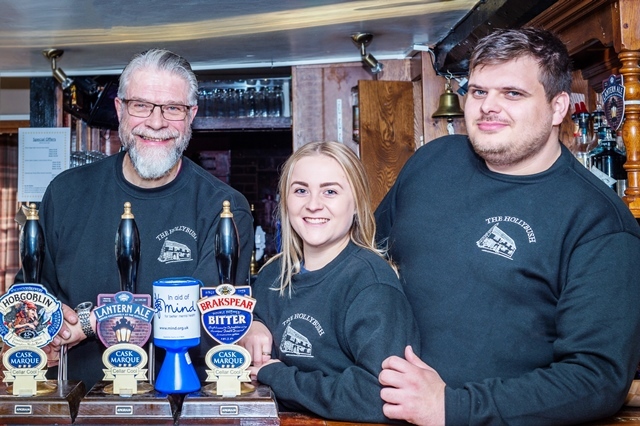 Pub operator and brewer Brakspear is supporting Mind, the leading mental health charity, for the next 12 months, with fundraising already underway in a number of their 130 pubs. Brakspear is aiming to raise £60,000 for Mind over the year as pubs and head office teams get behind the charity with a raft of fundraising activities from pub quizzes to live music nights and sporting endeavours. All pubs have received a collecting tin and a fundraising pack full of inspiring ideas from Mind, including a number of suggestions for the festive season. Tom Davies, Brakspear chief executive, said, “This is our third estate-wide charity campaign, and we’re confident that our licensees, their teams and customers, will once again rise to the challenge with enthusiasm, creativity and hard work and ensure our support for Mind is a great success. Rebecca Hastings, Head of Corporate Partnerships at Mind, said: “We are delighted to be Brakspear’s charity of the year. The company’s support will help us to reach a point where anyone with a mental health problem feels able to ask for, and access, the help they need. Gordon Dickens, licensee at the Hollybush in Redbourn in Hertfordshire, said, “We’re long term supporters of Mind, so we’re delighted that Brakspear has chosen it as their charity for the next year. We raised £300 through a pub quiz recently and we have other fundraisers in the pipeline including our annual charity football match, which raised more than £4,500 earlier this year. Brakspear has previously supported Sue Ryder and Marie Curie across its estate, raising a total of £92,000 for the two charities. Pubs are supported throughout the year with ideas and a range of POS such as stickers for menus and collars for tap water carafes. • 1 in 4 people will experience a mental health problem in any one year. • That’s every family, every workplace and every friendship circle. It’s approximately 15 million people in the UK. • Suicide is the leading cause of death for people aged between 20 and 34 years, and men are three times more likely to take their own lives than women. • The cost of poor mental health to the UK economy is estimated to be between £74 billion and £99 billion per year. • Depression is now the leading cause of ill health and disability worldwide. • Please note that Mind is not an acronym and should be set in title case. • Please contact the Mind Media Team for interviews or further information on 02085221743. For out of hours support please call 07850788514 or email the media team on media@mind.org.uk. An exciting new pub is now open in Hertford town centre, welcoming locals with delicious food, great drinks and a warm and friendly atmosphere. 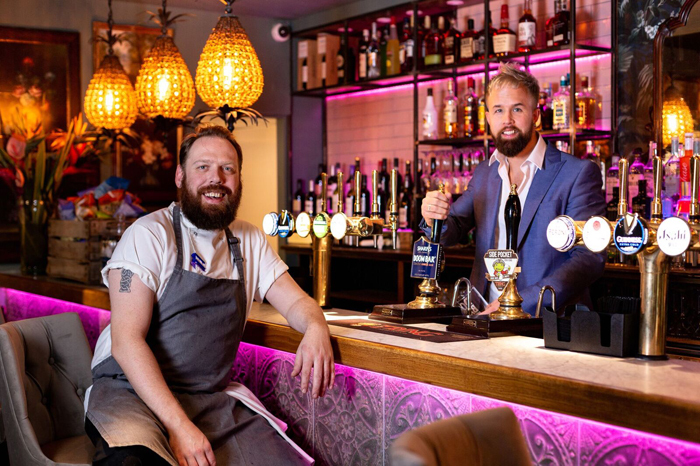 The Hummingbird, which has created 35 jobs for local people, has been opened by small independent pub company Aspley Pubs, who have given the Fore Street venue an extensive makeover to create a vibrant, stylish and warm and welcoming meeting place for locals. The Hummingbird is open throughout the day for breakfast, coffee and cake, and lunch and dinner. It is also the perfect place to catch up with friends and colleagues over a pint, cocktail or glass of wine. Head chef at The Hummingbird is Adam O’ Sullivan, from Bishop Stortford, who has 18 years’ experience as a chef, including at The Good Food Guide 2018 listed Water Lane Bar & Kitchen in Hertfordshire. O’ Sullivan and his talented team are handcrafting dishes for the seasonally changing menu which offers comforting pub classics with a twist, alongside exciting dishes with a global influence and delicious daily changing specials. Among dishes on the mouth-watering menu are small plates including tiger prawn scampi; potted smoked mackerel with lemon cream and beetroot jam, home-smoked duck with cashews and stir-fried Oriental salad and wild mushrooms and spinach on toast. Mains feature The Hummingbird’s signature dish of shepherd’s pie with lamb’s leaf mash, root veg and lamb liquor gravy; tandoori cauliflower with onion bhajis, lentil dhal and mango chutney; beer battered market fish and chips; the Reuben burger of salt beef, sauerkraut and Swiss cheese; and 10oz ribeye steak. For steak lovers a weekly Wednesday ‘Steak & Wine Night’ is also taking place featuring succulent dry-aged Cumbrian beef steaks served with an excellent range of sides and sauces. Customers looking for lighter dishes will not be disappointed with tasty dishes including mozzarella and red onion pizzetti; baked tortilla with fried egg, tomato salsa and chipotle hollandaise and superfood salad of sweet potato, kale, quinoa and pomegranate and mint dressing. For those who just want a quick sandwich and a drink, flavour-packed options include the Hummingbird BLT; smoked salmon and cream cheese bloomer; and a Hummingbird ‘Ham & Cheese’ toastie. It is most definitely worth saving room for dessert which include lemon tart with raspberry yoghurt sorbet; plum and pear crumble; double chocolate brownie or a choice of some of the best cheeses in Britain accompanied by a glass of fine port. Sundays are special at The Hummingbird with succulent roast meats accompanied by giant Yorkshire puddings and all the trimmings. The excellent vegan and vegetarian dishes would tempt even the most die-hard of meat eaters. There is no need to rush out of bed, as roasts are served from 12 noon to 9pm. A children’s roast dinner is also available, with complimentary ice cream for children dining on Sundays. Breakfast is also served daily with dishes to make you want to rise and shine including the Full English and Veggie Full English; chorizo and spinach baked eggs; and ‘The Benedicts’ – salmon, spinach or mushroom. Younger diners are warmly welcomed at The Hummingbird with dishes that both nourish and excite including baked fish fillet; grilled chicken breast burger; pork meatballs and pasta; fruit kebabs and ice cream sundae. Whatever your tipple The Hummingbird’s drinks list has something to wet your whistle from an expertly curated wine list and great real ales, to exciting cocktails and non-alcoholic drinks. At the bar quality real ales include Tring Brewery’s Side Pocket and Sharp’s Doom Bar. For those partial to a taste of the juniper berry, the extensive range of gins can be enjoyed in carefully crafted cocktails or in a classic G&T. Like the Hummingbird’s food, its cocktails also match to the seasons and in addition to signature cocktails such as the Epic Negroni, Espresso Martini and Pornstar Martini, seasonal specials include the Chilli and Mango Martini, Mo-Gin-To; Gin Ting and Beverley Hills Iced Tea. The Hummingbird team are also turning on the festive magic with exciting Christmas menus and events running from the 29 November. Among dishes on the Christmas menu are mulled winter lamb casserole; iron bark pumpkin and chestnut roast; turkey and apricot stuffing roulade; limoncello sorbet; and Christmas pudding tart. Dishes to ensure a memorable Christmas day meal include tea smoked duck breast; traditional roast turkey; slow-cooked rib of Cumbrian beef; Baileys tiramisu with mulled cherries; and of course warm Christmas pudding with brandy sauce. 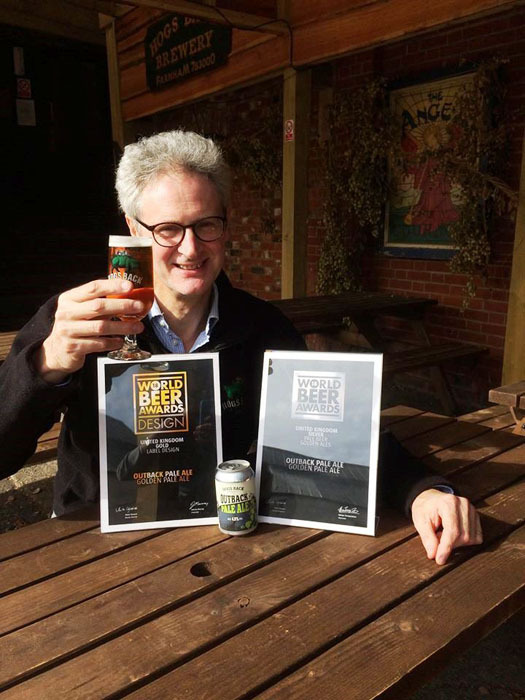 Hogs Back Brewery in Tongham is celebrating a double win at the World Beer Awards 2018. Its Outback Pale Ale picked up both a Gold Design Award and a Silver medal in the Golden Pale Ales category. The World Beer Awards judge thousands of beers from all over the world to find the best in the internationally recognised beer styles. A panel of over 100 international beer experts tasted the beers in London earlier this year, while a separate team of design specialists assessed bottles and cans for their visual appeal. Outback was the only UK brand to win a Gold Design Award, and one of three Golden Pale Ales to win a Silver medal. Rupert Thompson, managing director of Hogs Back Brewery, said: “We’re delighted that Outback Pale Ale has been recognised at this renowned international beer competition, especially as it is one of our newer beers, only launched in 2016. Outback Pale Ale is available in cans from supermarkets and specialist drinks stores, and on draught in pubs and bars. It is a 4.5% ABV golden ale with a light body and well-balanced, hoppy and citrus flavours, brewed from fine English malts and hops including Centennial, Cascade and, grown on Hogs Back’s own hop garden, Fuggles. Alcohol education charity Drinkaware has become the research partner of walking football in Scotland, supported by the Scottish Football Association (SFA) and Walking Football Scotland. The partnership, announced recently at Lesser Hampden in Glasgow, extends Drinkaware’s involvement in walking football north of the border and builds on its existing walking football partnership with Derby County FC. Walking football is a slower-paced version of the beautiful game for the over-50s, and used as a way of improving their physical and mental health and wellbeing. Through the partnership, Drinkaware will be gathering vital information from walking football participants on their health and alcohol consumption, allowing them to monitor participants’ drinking habits and subsequently try to improve them. Drinkaware will also be distributing information on drinking and its effects on health to Walking Football participants in order to educate them on the dangers of excessive alcohol consumption and the benefits of regular exercise. 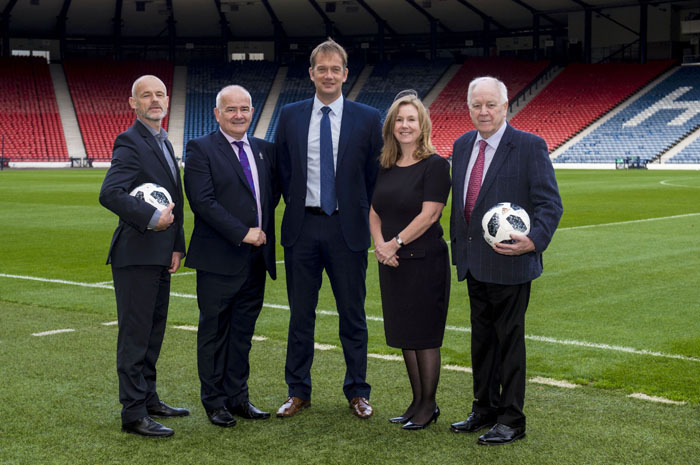 At the launch, Drinkaware Chief Executive Elaine Hindal said, “Drinkaware is delighted to be partnering with the Scottish Football Association.